A huge dinosaur with some distinctive headgear may have cut an unusual figure in its day 79 million years ago, but to scientists today, it fits as snugly as a puzzle piece in the history of its dinosaur family. At nearly nine meters [30 feet] long and weighing up to five metric tons, the newly found dino is the largest of its kind ever discovered. A giant among the group of duck-billed dinosaurs known as brachylophosaurins, it has earned itself the nickname Superduck. But what’s most surprising about this new species to scientists is not what’s big about it, but what’s small. It bears a tiny cranial crest, little more than a bony bump above the eyes. By contrast, its ancestors had no crests at all, whereas duckbills that lived millions of years after it sported large, flat crests. 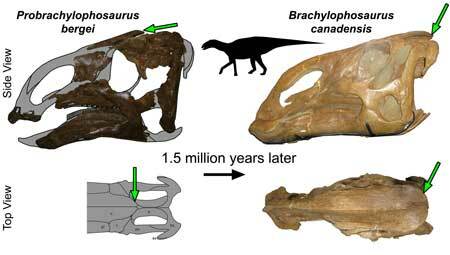 This suggests to paleontologists that the new animal — dubbed Probrachylophosaurus — is a true missing link, an intermediary type of duckbill that fills the evolutionary gap between earlier, crestless brachylophosaurins and their crested descendants. 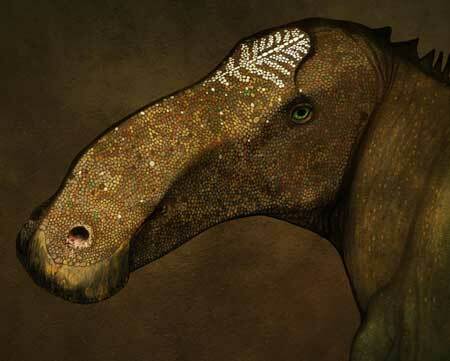 “The crest of Probrachylophosaurus is small and triangular, and would have only poked up a little bit on the top of the head, above the eyes,” said Dr. Elizabeth Freedman Fowler, the paleontologist who reported the find, in a press statement. This contrasts sharply with much earlier duckbills such as Acristavus, a crestless genus of brachylophosaurins that lived 81 million years ago in the same region as the new species, she explained. And yet, just 3.5 million years later, other types of duckbills appear in the local fossil record such as Brachylophosaurus, which displayed a prominent crest covering the back of its head. “The first bones we uncovered were the pelvis and parts of the legs, which were so large it led to the site being given the nickname ‘Superduck,’” Freedman Fowler said. But when she and her colleagues, including Museum of the Rockies’ Dr. Jack Horner, uncovered parts of a skull, they began to suspect that they had a new, and important, animal. What’s more, the same fossil deposit turned up the partial remains of another specimen of Probrachylophosaurus, this one a juvenile. Together, the two dinosaurs provided enough evidence for researchers to develop a theory about how and why duckbills developed bigger crests. The process, they believe, is a sterling example of heterochrony — a gradual change in the timing and development of living things. 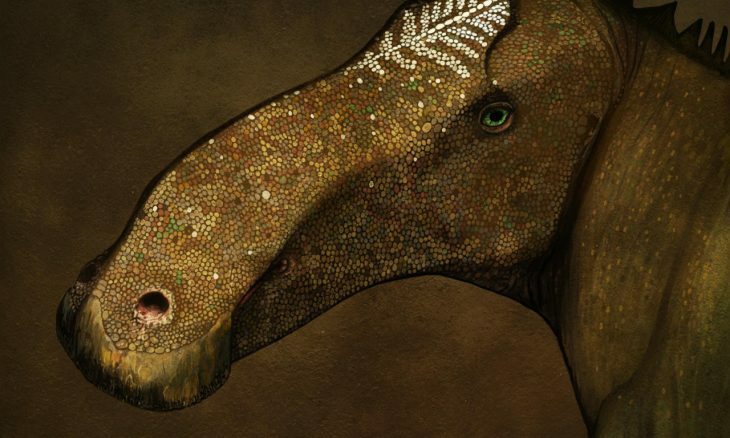 In this case, earlier and more ancient duckbills like Acristavus may have had the genetic instructions for making a cranial crest, but that particular piece of code never activated — leaving the animals crestless. But over evolutionary time, new types of dinosaurs appeared like Probrachylophosaurus, which began to sprout crests according to those genetic instructions, if only long enough to make a small bump. Then, by the time Brachylophosaurus came around millions of years later, heterochrony had led crest development to begin earlier in the animal’s life — or perhaps just to happen more quickly — giving adult Brachylophosaurus big crests. This kind of evolutionary deduction is only possible thanks to improvements in technology that enable paleontologists to date rock layers more precisely and glean more specifics about an animal’s life history from its fossil bones, Freedman Fowler said. “Heterochrony is key to understanding how evolution actually occurs in these dinosaurs, but to study heterochrony we need large collections of dinosaurs with multiple growth stages, and a really precise time framework for the rock formations that we collect them from,” she said. “The Late Cretaceous of western North America is the only place in the world where we can do these kinds of intense paleobiological studies on dinosaurs,” she added. “It is really exciting to see that we are still making significant discoveries there,” he added in the statement. Freedman Fowler and her colleagues report their findings in the journal PLoS One.